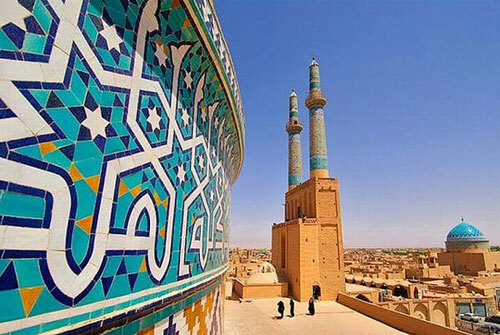 Built in the 12th century, the Jāmeh Mosque of Yazd is one of the most eminent mosques in Yazd city, Iran. It is depicted on the Iranian 200-rial banknote. 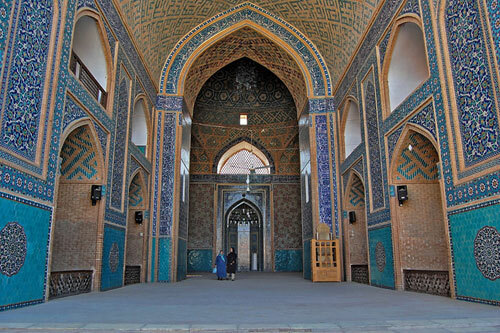 Largely renovated in the 1300s, the mosque is one of the remarkable 14th century buildings of Iran. Aside from featuring Iran’s tallest minarets at 48 meters, the mosque’s outstanding beauty is reflected through the impressive mosaic tile work that covers its entirety, including its large dome, minarets, and interior chamber. The mosque is a dazzling sight with its portal facade decorated from top to bottom with beautiful blue tile work, its long arcaded courtyard, its sanctuary chamber, and its squat tile dome exquisitely decorated with faience mosaic. 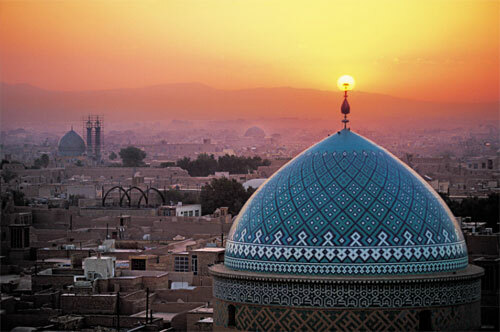 The mosque is still in use today and is considered a glorious masterpiece and an important remnant of Yazd.